West-Griffin’s interest in chemistry began in his pre-teen years with summers spent in school in Naperville, Illinois. At North Central College he was too young to be in the summer program, but enrolled thanks to the guidance of a caring teacher – who was also his godmother. In nearby Chicago, a chemistry set caught his eye. “Go get it,” she told him. “From that day forward, I just got fascinated with chemistry,” West-Griffin says. By the age of 13 he was studying chemistry and physics, and was completely fired up for science. His passion for science continues to burn brightly, igniting sparks in his students. “You show excitement and be sincere … and have a passion for it, and the kids will see that” —and they will also draw inspiration from it. This Star Teacher’s honors could fill a flag. 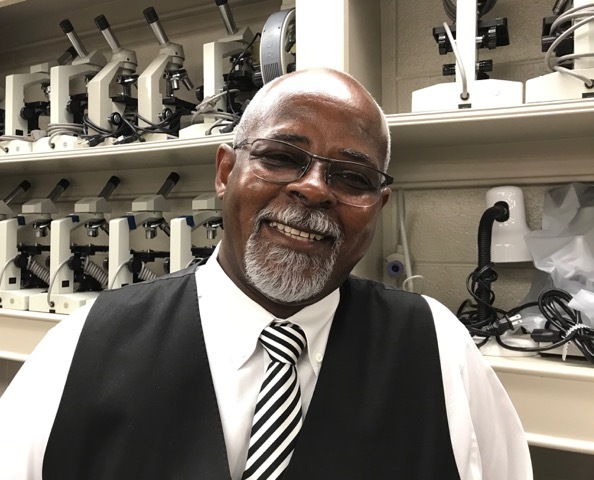 He earned several at Bailey Magnet School in the ‘90s and added seven to his collection while teaching at Clinton High School in the 2000s. The STAR program recognizes students for scholastic excellence, and the teachers those students found most inspirational in their studies. “I’m a teacher first,” says West-Griffin, but he is also a former coach. At Mississippi Valley State University, he coached NFL football great Jerry Rice. Outside of class, he’s working on his third degree black belt in Taekwondo. He’s also a minister. “That’s my passion. I draw everything from that,” he said of his faith. He and his wife are involved with several ministries at New Mt. Calvary Christian Center. “We need more medical doctors, we need more research scientists, we need more engineers,” says West-Griffin. He wants students to develop a passion for science as a career. Building on the foundation laid by the STEM programs at JA, this STAR teacher is poised to continue inspiring students to explore the world through the lens of science.